Travel information about the South Korean city Busan. Read more to learn about the city's attractions, places of interest, dining and shopping areas and more. 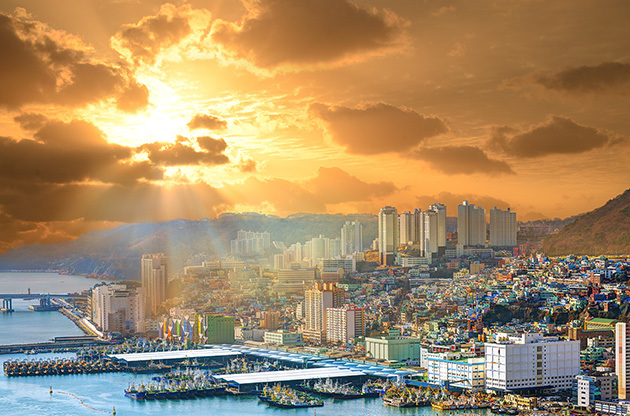 Busan, an impressive coastal metropolis with a boldly Korean flavor, boasts stunning natural beauty, rich cultural roots and a highly respected position on the international business stage. The second largest city in South Korea, it offers visitors easy access to scenic beaches, trendy shopping outlets, a hip art scene and of course, the charming hospitality of the Korean people. Both the largest port in the country and a burgeoning business center, there remains a sense of calm and balance, amidst the competitive drive to establish an internationally recognized destination for both business investors and recreational tourists alike. Busan prides itself in having established itself as an arts and culture power-house, and has poured manpower and financial resources into creating the high quality cultural tourism that it offers today. The popularity of the acclaimed Busan International Film Festival within international circles serves as concrete proof that Busan has succeeded in carving out a place for itself in the global arena. In true Korean style, there is a continuous wave of festivals and other cultural events to enjoy, for every month of the year. The vast hidden treasures of this often underestimated country are revealed in the way that Korea continuously celebrates life and legacy. From the famous annual Fireworks festival to the Busan International Tea Cultural Festival, the free spirit of Busan permeates every part of daily life. Busan is a fantastic destination all year round and lodges a faint longing in your heart to return someday. Do not hesitate to include this amazing city on your list of places to see. Busan awaits. This beautiful city lies on the scenic, south-eastern corner of South Korea. How to get to Busan? Gimhae International Airport in Busan, then Gimpo International Airport serves as the main departure point for flights. It is located in the western end of the city. The official website of the Gimhae International Airport provides the necessarry information about the travel options to & from the airport. The world-class South Korean transportation system ensures efficiency and punctual convenience, while commuting to and around Busan. The reliability of the train and subway systems offers a user-friendly way of exploring the city. The stylish new subway line, the Busan-Gimhae Light Rail transport, connects Gimhae International airport to the rest of the Busan subway system. Subways are very easy to use, always well sign-posted (usually in English and Chinese) and are always punctual. Taxis are always readily available, in every part of the city, during the day and the night, even into the wee hours of the morning. With an international license, it is also a possibility to hire a car; however, the congested traffic of the city and hair-raising Korean driving style may encourage you to stay with the superior expertise of the local taxi drivers. The serenity of the ancient Buddhist temples provides a chance for self-reflection. By far the best temple in Busan, the Beomeosa temple on Mount Geumjeongsan, holds 1300 years history from the Silla dynasty, housed within stunning Joseon dynasty architecture. And that is only one temple of many to be found in the Busan area. Visit the world-renowned Busan Museum of Modern Art, which is open Tuesday through Sunday, from 10h00 to 20h00. It is conveniently located at the Busan Museum of Art subway stop (Line 2) and showcases exhibits from an abundance of famous artists and sculptors, including famous Korean artist Lee Hyung-ku. Conveniently, only two subway stops away from this art museum, is the luxury shopping and dining destination of Haeundae. If you are craving some time out from a busy schedule, the Korean spa experience is just what you need. Considered a national pastime, Korea is famous for its luxury spa “public bath” facilities, hot springs and body treatments. One of the oldest and most frequented spas is Hur Shim Chung and is located approximately 6 kilometers away from Haeundae, in central Dongnae area. Take a few moments out of your day to participate in the blissful "Coffee culture" of South Korea and spend time relaxing inside one of the upmarket coffee shops, sipping on a hot (or iced) cup of heaven. The abundance of classic coffee shops in the Haeundae beach area is a great place to start. If there is one area in which South Korea excels, its in providing the ultimate experience in luxury shopping. You can find absolutely anything you could possibly want, in any variety; from futuristic technology to age-defying healthcare products to high end fashion. Haeundae is generally regarded as the preferred retail destination, with its sparkling department stores and trendy fashion outlets. The Jung-gu Lotte Department store complex comes in a close second with its fashionable brand names and panoramic views of the city from the top floor. Designer outdoor gear, the latest mobile and computer products, award-winning skin care products and health enhancing herbal remedies, such as the famous Red Ginseng products, are just a few of the luxury goods you will be able to find here in Busan. In Busan, a perfect night out is never far away. A city with an abundance of entertainment and fine dining options, Busan guarantees tastes to tantalize every palette. Jagalchi Fish market, the biggest of its kind in South Korea, is astounding, especially if for those unfamiliar with Asian-style open markets. Find whatever seafood your taste buds desire and enjoy a fresh, tasty meal prepared for you by experienced local chefs. The live baby octopus delicacy or a delicious King crab, are first-class meal choices. The “Let’s Eat” alley, Changseondong Meokja Golmok, lies just across the road from the Jagalchi Fish market and provides a great opportunity to try the huge variety of local Korean food, prepared right in front of you. If you are not a fan of seafood, then simply head out to one of the great number of international restaurants that are located all over this cosmopolitan city. For a sizzling party scene, head over to Gwangalli Beach and prepare yourself for a fantastic night out exploring all that the beachfront has to offer. The Korean love of karaoke (or noraebang) is widely regarded as the national pastime for both business and social gatherings. Beware, the unexpected kick of Soju (potent Korean rice wine) lingers far longer than one would care to admit. Catch a sports match playing out on the big screen, at one of the local sports bars on the strip; while you admire the sparkle of Gwangalli bridge, the bay lit up by the twinkling reflections of the colorful lights. If you need a little assistance with translation, or any information about Busan or South Korea, just dial 02-1330 to receive professional assistance from a friendly operator, in the language of your choice.